On 1.8.18 we were in Walldorf and discussed the new common strategy of SAP and conesprit. We look forward to the future closer cooperation. Together with Armin Fechter, editor of Backnanger Kreiszeitung, we talked about the Backnager roots of our company as well as the advantages of our SAP BI solution Sesam for SMEs and the first place in the Innovation Award IT 2018 (category BI). You can find the article in German here. The interview with our CEO Roman Douverne, which took place during the award ceremony, can be found here. The Initiative Mittelstand awards the Innovation Prize-IT 2017 to particularly innovative IT-solutions with a high value for SMEs. Sesam was able to convince the expert jury and to prevail in the category Business Intelligence against 108 other applicants. As part of our participation in the DIGITAL FUTUREcongress, our CEO Roman Douverne was interviewed about our SAP BI solution Sesam. Read the entire interview here. conesprit GmbH has joined the International Association for SAP Partners (IA4SP) e.V. The IA4SP provides the organizational framework for the joint advocacy of SAP’s partners. We are looking forward to interesting contacts and inspiring working groups. Why “SAP BI as a Service” is an opportunity for SMEs, you can read in the following article written by our managing director Roman Douverne and published in S@PPORT, the magazine for SAP users. On 19 October, the the expert conference for Business Intelligence, Big Data and Advanced Analytics of Controller academie in Munich took place. 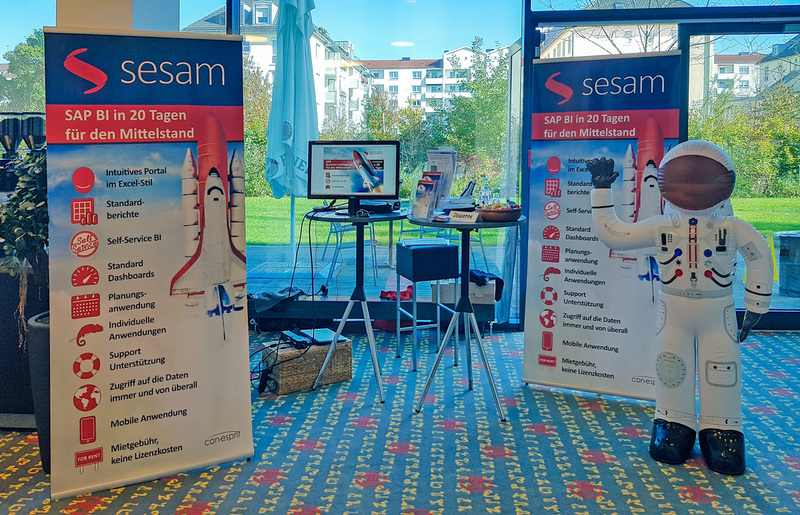 In addition to informative and instructive lectures on the topic of digitization, BI & Data Warehouse as well as Big Data, the participants had a lot of time to learn about Sesam our SAP BI application. We would like to thank all participants for the exciting discussions and look forward to the next talks.. In the period from November to December 2016 we conducted a market study on the subject BI as a Service in cooperation with Heilbronn University. The study, attended by 350 experts, deals with the status quo of use of enterprise resource planning (ERP)and business intelligence (BI) applications, as well as with the benefit and needs of BI applications. In addition, reasons for purchase of BI as a Service (BIaaS) as well as advantages of and reservations against BIaaS are highlighted. The detailed study and a summary of the results are available here. The Initiative Mittelstand awards the Innovation Prize-IT 2017 to particularly innovative IT-solutions with a high value for small and medium-sized businesses. Sesam was able to convince the expert jury and was awarded with the title BEST OF 2017 in the Business Intelligence category. take part in a raffle of 20 Amazon vouchers of 35€ each. Sesam will be exhibiting from 4th to 6th October at IT & Business in Stuttgart. In this context, S@PPORT, the magazine for SAP users, has also become aware of Sesam. Read the whole article here. Centralization and standardization of customer templates E.g. customers can connect a word template with their BI Director template to further standardize the documentation. Since today BI Director Release v2.2.0.0 is available in our download portal. The release contains substantial enhancements and bug fixes for the applications BI Compendium®, BI Inspector and BI Q. A new key feature is the integration of the BI Q reports into the BI Compendium and BI Inspector respectively. Furthermore, this release includes a newly created BI Director Launcher. With this application, you can start all BI Director applications by a central component. You can link the file type .BIPROJ to this launcher and open .BIPROJ files by double clicking them in the Windows-Explorer with your preferred application.